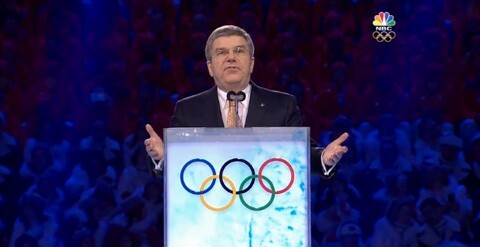 Deadspin reports that NBC edited out a significant portion of IOC President Thomas Bach's opening ceremony remarks when it broadcast them last night. Now you are living in an Olympic Region. I am sure you will enjoy the benefits for many, many years to come. Thousands of volunteers have welcomed us with the well-known warm Russian hospitality. Many thanks to all the wonderful volunteers. Bolshoi spasiba, valantyoram! Thank you very much to everyone. Russia and the Russians have set the stage for you, the best winter athletes on our planet. From this moment on you are not only the best athletes, you are Olympic Athletes. You will inspire us with your outstanding sports performances. You have come here for sports. You have come here with your Olympic dream. The International Olympic Committee wants your Olympic Dream to come true. This is why we are investing almost all of our revenues in the development of sports. The universal Olympic rules apply to each and every athlete- no matter where you come from or what your background is. You are living together in the Olympic Village. You will celebrate victory with dignity and accept defeat with dignity. You are bringing the Olympic Values to life. In this way, the Olympic Games, wherever they take place, set an example for a peaceful society. Olympic Sport unites people. This is the Olympic Message the athletes spread to the host country and to the whole world. Yes, it is possible to strive even for the greatest victory with respect for the dignity of your competitors. Yes, Yes, it is possible – even as competitors – to live together under one roof in harmony, with tolerance and without any form of discrimination for whatever reason. Yes, it is possible – even as competitors – to listen, to understand and to give an example for a peaceful society. Deadspin has video and a full transcript, if you'd like to take a look. It's worth noting that Bach's remarks that were broadcast did mention diversity, tolerance, and peace. Not that Russia or the IOC is paying ANY attention to those precepts.